In the book, I mention seeing crab burrows as I’m standing on the beach near Cooktown. I thought folks might wonder what a crab burrow looks like and how you can identify one. 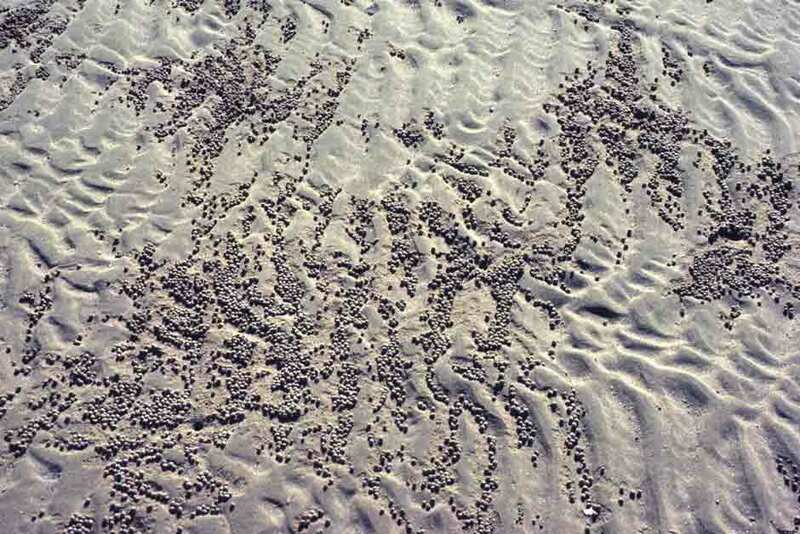 Well, it’s quite simple, really—just look for the “crab balls.” There are species of crabs on this coast that live on the bits of organic matter—animal and vegetable—that constantly wash up onto the sand. They actually scoop up and eat the sand “soup,” absorbing the nutrients and depositing the waste sand in little balls. When you see large collections of these balls, look for the burrows. In the picture below, you’ll note the small holes that show where the crabs have dug in for the day. When gold was discovered in California in 1848, it triggered a tremendous Gold Rush. A handful of nuggets were discovered at Sutter’s Mill, and soon, thousands of fortune seekers were flooding westward—a population surge so great that within two years, California had enough people to become a state. There were a number of lesser gold rushes in other states through the 1870s, but California’s was the big one, the one that defined Gold Rush in the American mind. However, though people flooded in from the East Coast, the lure of gold also drew a flood of fortune seekers from China—20,000 a year at the height of the Gold Rush. The Chinese called America Gam Saan—the Gold Mountain. Driven by poverty and hardship, they left China and came to the United States, hoping to strike it rich and then return home. When gold was discovered in Australia a couple decades later, Australia became “New Gold Mountain,” and hopeful Chinese fortune seekers flooded southward—not just because it was the newest site—and a much closer one—but also because things weren’t all that easy in the U.S. Gold was hard to find and Californians, both new and established, weren’t adjusting well to the dramatically increased competition for limited resources. As with the California Gold Rush, the idea in Australia was to strike it rich and then go home with as big a piece of the gold mountain as possible. However, as with California, not everyone made it home. Sometimes folks just settled down and made new lives. Sometimes, having failed to strike it rich quickly, they just worked on year after year. Of course, many died—of all nationalities. It was a remote area and life was hard. 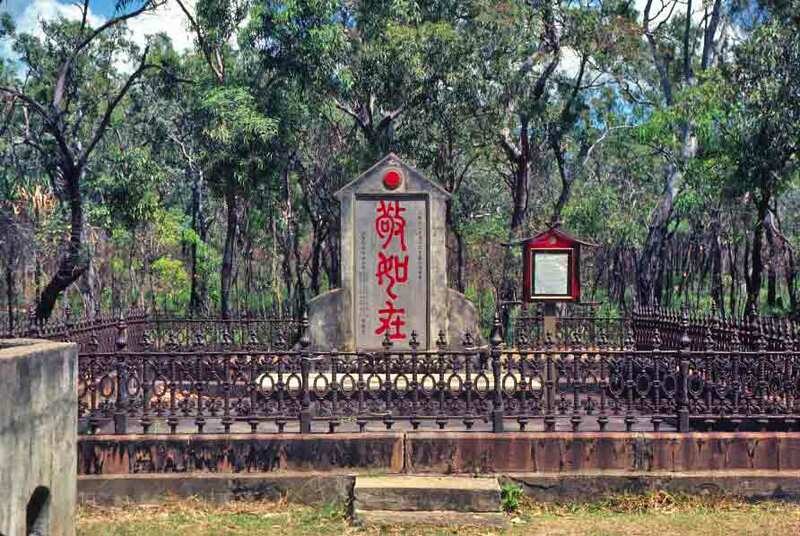 Outside Cooktown, in the far north of Queensland—site of one of Australia’s several gold rushes—the Chinese community erected a memorial, shown below, to those who did not return from the gold rush. It is a solemnly isolated monument, surrounded by the thick foliage of this region. One of the day trips I took while I was in Cairns was out to Green Island. Green Island is a coral cay, which means that, unlike the islands I visited farther south in Queensland, this island is not a mountain rising up out of the reef; it is actually part of the reef. As a result, it’s lower and flatter than the Whitsunday Islands. It is also spectacularly beautiful and a great spot for reef walking. The photo below is from the beach on Green Island, looking back toward the mainland. The Botanical Gardens in Cairns are wonderfully lush and filled with exotic flora. As with most Botanical Gardens, the plants on hand are both indigenous and imported. While I had seen bottle trees, sausage trees, and monkey puzzle trees in other parts of Queensland, it was at the gardens in Cairns that I encountered my first cannonball tree. 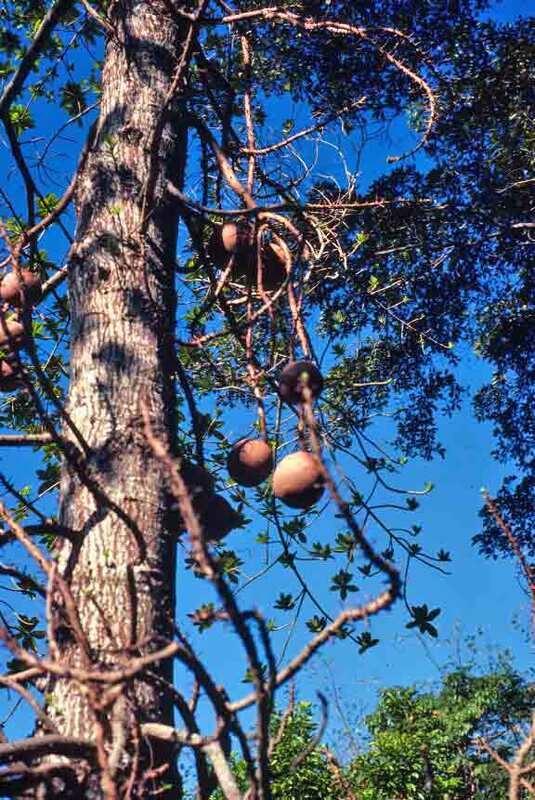 The cannonball tree is a native of South America. It’s a softwood tree that produces large, woody fruit that looks very much like rusting cannonballs. It was not the most fabulously lush or beautiful thing I saw in the Cairns garden (and there was much that was lush and beautiful), but it was the oddest thing I saw there. 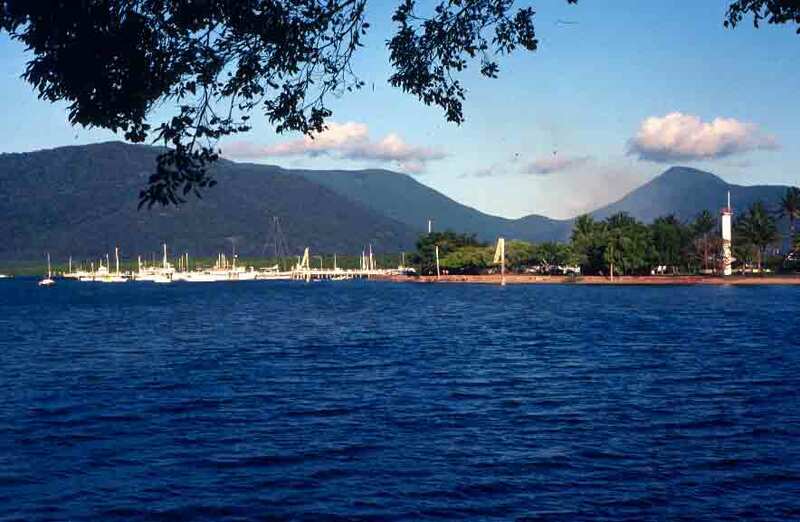 Cairns is a tropical paradise that is also a major gateway to exploring the rain forests of northern Queensland, the Atherton Tableland, and the Great Barrier Reef. So not a place to be missed. Cairns was my next destination after Townsville. The town sits on lovely Trinity Bay and is sheltered by surrounding hills. Tropical birds and tropical flowers are abundant. In Cairns, I explored gardens, visited the Royal Flying Doctor Service and School of the Air, wandered through Aboriginal art galleries, and enjoyed the local gelato. I also used Cairns as a jumping off point for a variety of other adventures. The photo below offers a view of Trinity Bay—I’m looking south from the Esplanade across the street from my hotel. In my book, I mention crossing bridges over dry riverbeds as we drove from Charters Towers to Townsville. Below you can see the most impressive of these dry riverbeds. 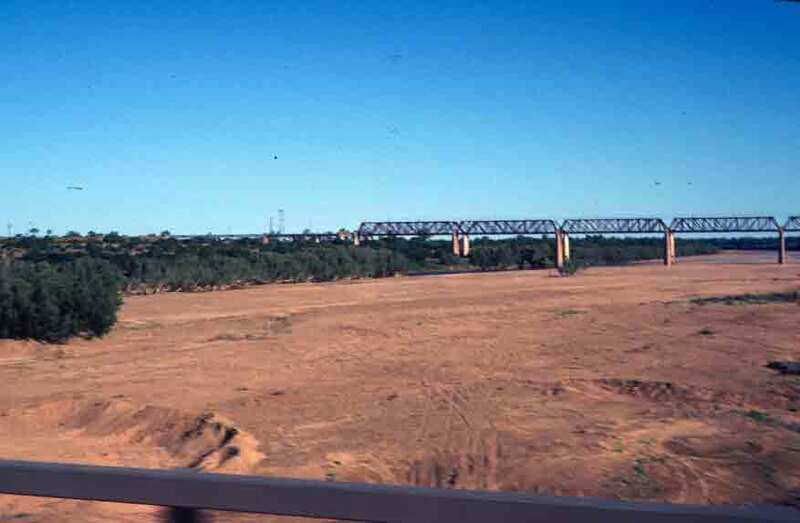 This is the Burdekin River, one of the most important rivers in Queensland. 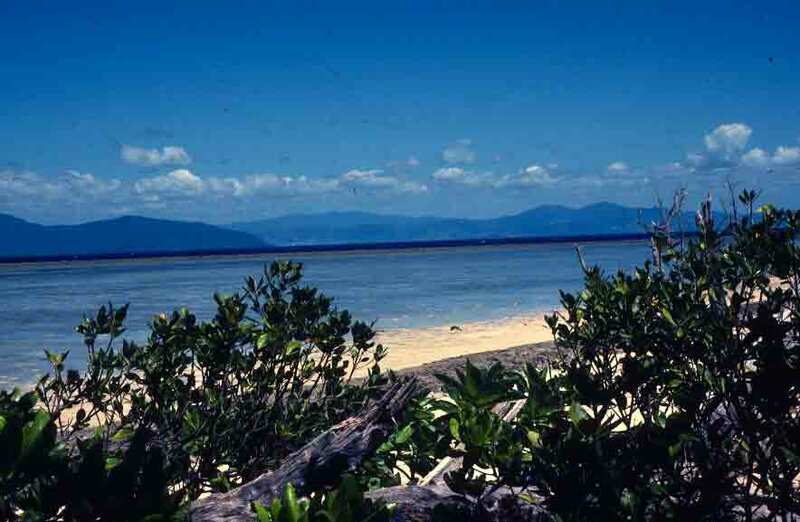 The Burdekin rises in the Seaview and Gorge Ranges and flows about 450 miles to the ocean at Upstart Bay. The river drains an area of 50,400 square miles—when there’s rain. This far north, you generally get two seasons: the Dry and the Wet, and the Wet, the summer rainy season, is when the Burdekin is in flood. It was astonishing to note the high water markers standing at the entrance to the bridge—tall “rulers” that show how high the water can be at flood. This was particularly remarkable in light of how far above the riverbed the bridge is. The railroad bridge visible in the photo gives you some idea how high the highway bridge is—and suggests how wide the river is when at full flood. Perhaps not obvious from the photo, there is still a thin stream of water flowing among the trees that may look like they line the riverbank. The trees are in fact in the middle of the river—they simply get inundated when the seasonal floods come through. But it is this stream and the attendant greenery that create a home for the varied wildlife (especially birds) indigenous to the area. While this photo might make the Burdekin River look uninspiring, factors such as its economic importance, biodiversity, and impact on the Great Barrier Reef make it an area of intensive study. Outside of Charters Towers, I met prospector Henry Weare, who told me he smelts gold and silver in his bare feet because the hot coals would ruin the leather if they fell on his shoes! Yes, there is still gold to be found in Queensland. However, as Henry explained, it’s hard to find. 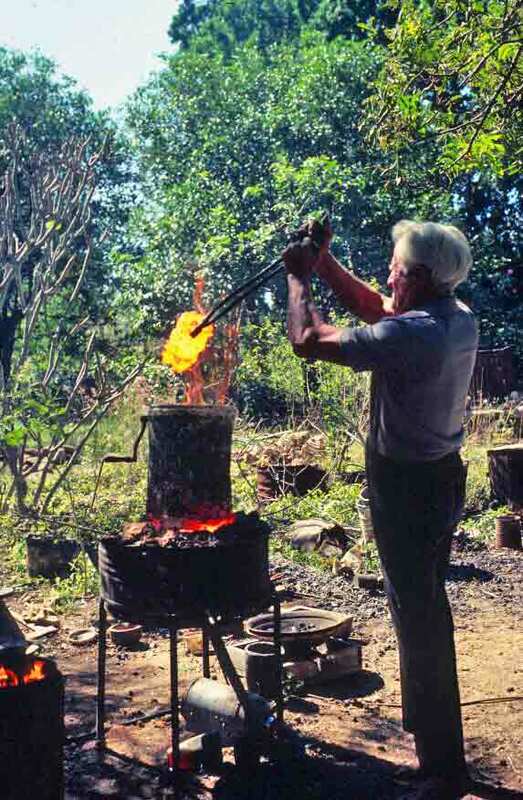 I think this photo suggests just how hot the clay smelting crucible (the glowing object held with the tongs) gets when Henry stokes the fire.